Sorrento Sportfishing Charters – We offer individual or group fishing trips from Sorrento and Queenscliff, fishing Port Phillip Bay, The Rip and Bass Strait for Snapper, King George Whiting, Salmon, Kingfish, Gummy Sharks, Mako Sharks, Blue Sharks, Nannygai, Calamari, Bass Strait Flathead and many other species. King Island Extended Charters – We offer 3 day fishing charters between January and March. These trips include return flights departing Moorabbin Airport at 06:00am to King Island and arrive at 07:00am in time for your Fishing Charter from Currie Harbour. The waters around King Island are a fisherman’s paradise and are home to a wide variety of species including Mako Sharks, Kingfish, Tasmanian Striped Trumpeter, Nannygai, Morwong, Salmon, School Sharks, Gummy Sharks, Crayfish and many more. Our Boats – Due South, a 60’ Westcoaster Sportfish & Strait Shooter, a 41’ Steber Sportfish, are under full AMSA survey and cover survey status from Class 1C to 2B which enables us to fish up to 100 nautical miles from any Australian port. This giving us the ability to take you fishing to some awesome fishing grounds, untouched by others and accessible to few. Proline Fishing Charters now has the biggest charter boats available in Victoria. All our vessels are equipped with undercover and outdoor seating with side curtains, BBQ, private toilet facilities, Furuno Digital GPS, Radar & Fishfinding equipment to make sure your have the best possible opportunity to be where the big ones are. A current Victorian Fishing Licence, Warm clothes to suit the weather,hat,sunscreen,spray jacket, & camera. Leave an esky in your car to keep your fish cool on the way home. Alcohol is permitted in MODERATION and this will be STRICTLY adhered to. Please refer to the Proline Fishing Charters website for our Terms & Conditions. 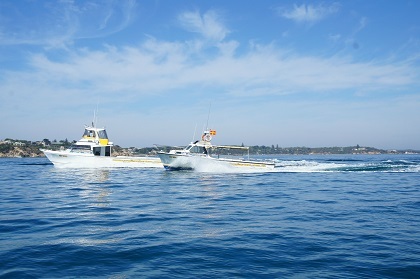 King Island charters do not require a Fishing Licence. Berth 1, Sorrento Pier, Sorrento, Victoria, 3943, Australia.